Christie’s Country Store closed in December. But less than 4 months later, the 6-decade Cross Highway tradition continues. Chef’s Table opened today. That’s good news for residents of the Cross Highway neighborhood. As well as workers and delivery people in that area. Plus of course students at nearby Staples High and Bedford Middle Schools. 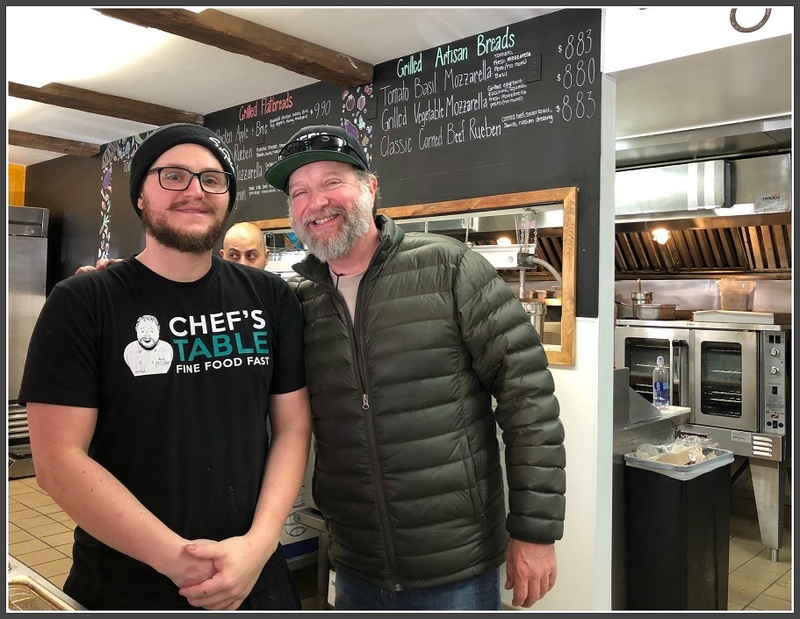 Owner Rich Herzfeld and son Dave — who will manage the eat-in/takeout breakfast-sandwich-grill-soup-pizza-and more place — greeted a steady stream of happy customers, starting early this morning. David and Rich Herzfeld, earlier today. In February, Rich told “0688o” he hoped to open by April 1. Staples High School students enjoy the new spot. 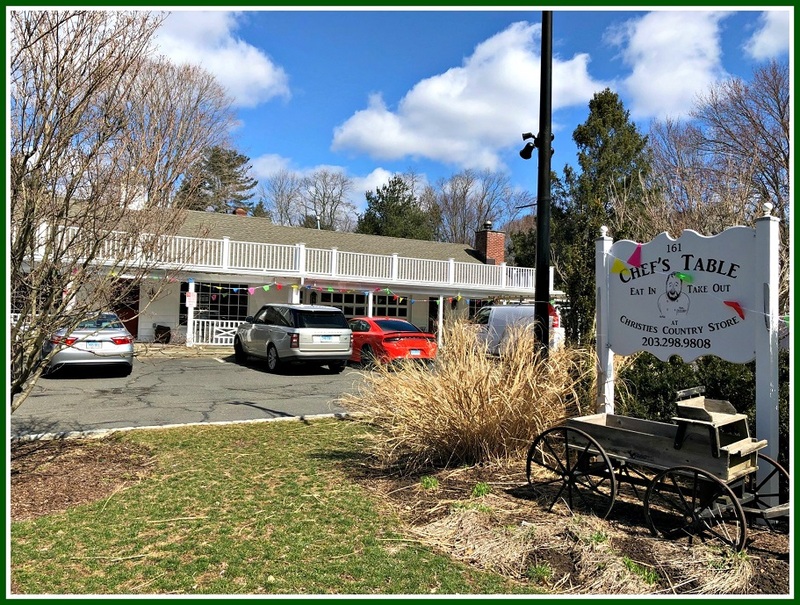 That’s a great omen for Chef’s Table, which began in Westport (both locations closed after the 2007 recession), and now includes a very popular spot in Fairfield. Chef’s Table Returns To Westport! Cross Highway Rejoices. When Christie’s Country Store closed in December, a shiver went through the Cross Highway neighborhood. The breakfast/sandwich/grill/grocery place had been around since 1926. It served nearby residents, Staples and Bedford students, and plenty of landscapers and workers nearby or passing through. But it was a non-conforming use, in a residential area. Now it was shut. These things don’t usually end well. Chef’s Table is moving in. Rich Herzfeld will pick up right where John Hooper left off. It’s a homecoming of sorts. Herzfeld — the Culinary Institute of America-trained baker/chef, who honed his trade under Jean Yves Le Bris at La Gourmandise in Norwalk — set off on his own in 1995. 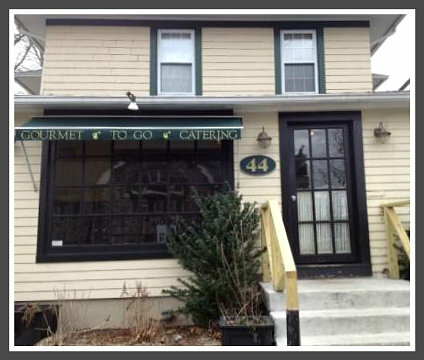 He opened his first Chef’s Table at 44 Church Lane. It was, Rich recalls, “like a small Hay Day.” High-end prepared foods and fresh salads drew a devoted downtown crowd. Two years later, Herzfeld added soups. 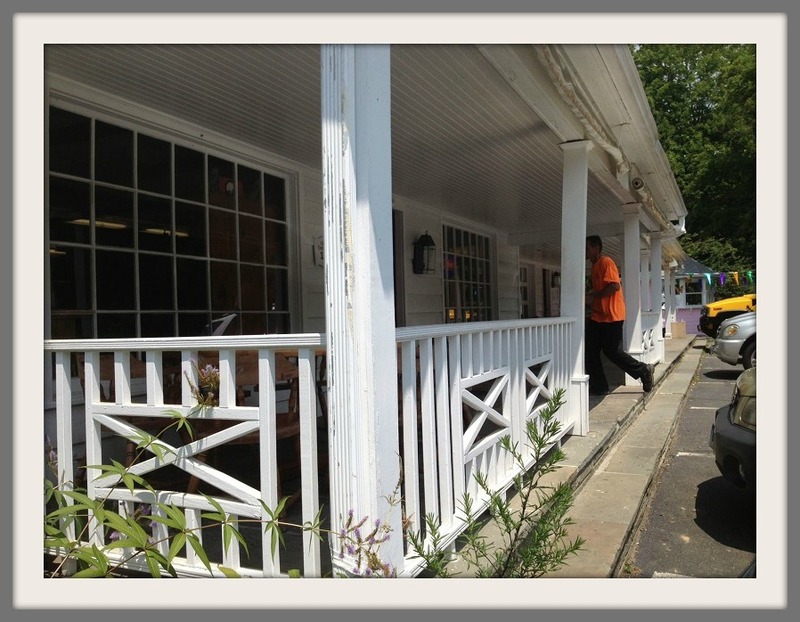 In 2001 he opened a 2nd Chef’s Table, on the Post Road in Fairfield. Two years later he added a 3rd, in the former Arcudi’s pizza restaurant next to Carvel. The 2007 market crash hit the 2 Westport locations hard. Suddenly, Rich says, everyone was brown-bagging lunch, or eating fast food. Corporate catering dried up. The Fairfield site — with a broader demographic — did fine. Rich sold the Church Lane spot to the Wild Pear. Arcudi’s returned to its original spot. Wild Pear took over from Chef’s Table, on Church Lane. It closed in 2013. After extensive renovations, it is now the site of Aux Delices. The 2 locations changed hands again. Today, both — coincidentally — are Aux Delices. 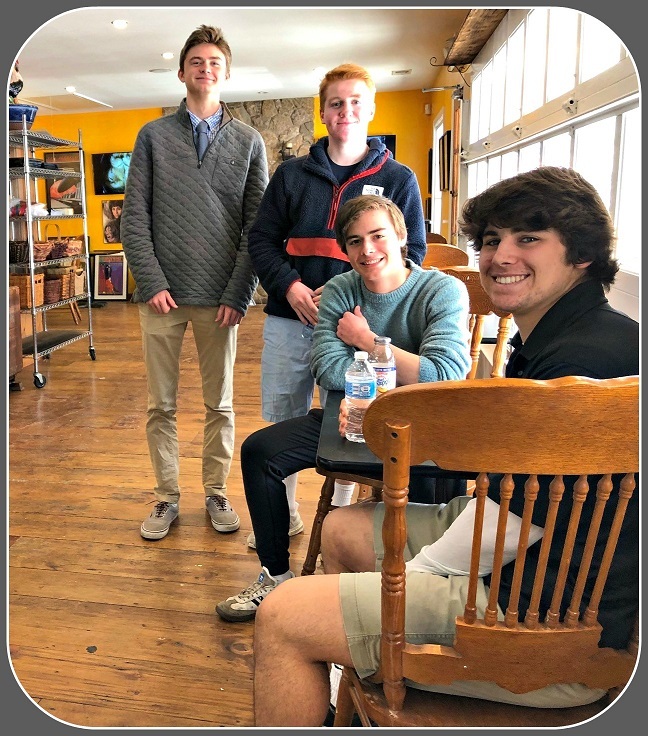 Meanwhile, Rich had asked commercial realtor (and Staples High School graduate) Tom Febbraio to keep an eye out for any place here that was already set up for a Chef’s Table-type operation. Last year, John Hooper’s Christie’s lease was up. Tom told Rich. He was not only interested — he’d loved it for a long time. He’ll sell his signature soups, salads and sandwiches. A few years ago he got back into baking, so there will be plenty of croissants and baguettes. 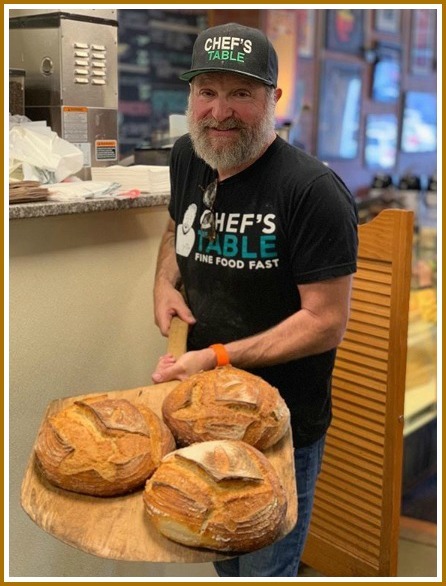 Rich Herzfeld, with his delicious sourdough bread. The Fairfield location — not far from Fairfield University, Fairfield Ludlowe High and 2 middle schools — is “student-centric,” Rich says. His new Cross Highway spot is even closer, to Staples High and Bedford Middle Schools. He plans to sell old-fashioned candy, ice cream — and items like milk, sugar and toilet paper, for neighbors who just need one or two quick items. And he would love to resurrect the Frosty Bear ice cream gazebo. Though Chef’s Table will operate from around 6 a.m. to 7 p.m., Rich predicts his bread-and-butter will be breakfasts and lunches. He’s especially excited to serve breakfasts — “good food, providing great energy” to folks working in the area. Christie’s — with its handsome front porch — has always been a welcoming, neighborhood place. The Cross Highway store will be overseen by Rich’s son David. Now 29, and the breakfast guru at the Fairfield spot, he grew up at Chef’s Table on Church Lane. When he was just 9, David was baking cookies — and selling them at a table there. Rich knows the 93-year history of the spot he’s moving into. He loves the legacy. He can’t wait to begin writing the next chapter.